As a boy, John Lennon had to choose between mom and dad. This heartbreaking story has been repeated in various biographies and books about the Beatles. John’s father, Alfred “Freddy” Lennon, worked as a seaman and was not home in the first five years of his life. When he came back, he took 5-year-old John with him on a short holiday, and then wouldn’t return him to his home in Liverpool (in an area known as Merseyside). When his mother, Julia, came to get John, Freddy asked John if he wanted to sail away to seek his fortune with his father. Of course John said yes. Fighting back tears, Julia said goodbye and left John with Freddy. In a few minutes it dawned on John that Julia was leaving forever, and he raced out of the holiday cottage and ran down the street to catch his mother! He stayed for a while with Julia, but eventually Julia left him with her sister Mimi and her husband George, who raised him. John lived with Aunt Mimi until his late teens, when he went off to Hamburg with the other Beatles. Paul knows “20 Flight Rock” and shows John how to tune a guitar. When Paul McCartney first met John, John was the leader of the Quarrymen on one of his first gigs. The Quarrymen were a skiffle group, inspired by skiffle tunes such as “Rock Island Line” by Lonnie Donnegan. Paul met John after the gig and showed him how to tune his guitar, then played Eddie Cochran’s “20 Flight Rock” flawlessly. For an example, first listen to Eddie Cochran’s original version, and then Paul McCartney’s CHOBA B CCCP (Back in the USSR). This impressed John. For a while John agonized over whether to ask someone so much more musically competent than he was to join his band, but realized eventually that the band itself mattered more. John and Paul would eventually form one of the most famous songwriting partnerships in popular music, and become the most influential composers in rock and roll. Pete Best, Stu Sutcliffe, Astrid’s haircuts, and the Hamburg gigs. The Beatles hired Pete Best as their first drummer because they were leaving for Hamburg the next morning and needed a drummer for the gig. 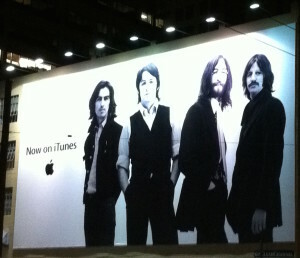 But Pete Best never did fit in, really. He was always the “quiet one” and when the Beatles started changing haircuts and styles, Best remained the same. They eventually dropped Best for Ringo Starr, the drummer with Rory Storm and the Hurricanes (another Liverpool band), before starting to record as the Beatles. The Hamburg experience also brought the three original Beatles together with Tony Sheridan for a studio session, covering songs such as “Ain’t She Sweet” and “My Bonnie” (which became the group’s first hit in Liverpool). Also during the Hamburg gigs, the bass player was Stu Sutcliffe, John’s friend from art school, who’s first love was painting. Sutcliffe eventually dropped out to stay in Hamburg with Astrid, the avant garde German photographer who first styled the Beatles’ haircuts into the infamous moptops. Sutcliffe was literally the first moptop — the first to use the hairstyle in the band. The story of Sutcliffe and his untimely death due to a brain hemmorhage is the subject of the movie Backbeat. Brian Epstein, NEMS, and the Cavern Club. 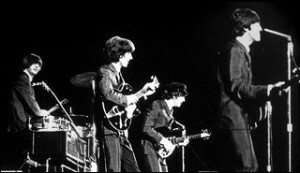 Brian Epstein, the manager of the Beatles, wrote in his autobiography, A Cellarful of Noise, that he was attracted to the Beatles’ physical stage presence as well as to their talent. Brian was gay, but most certainly in the closet. A lot of undue attention has been given to the notion that John Lennon may have had a fling with him. Brian was certainly very close to his boys, but the Beatles books are very clear on the point that he kept his private life private, even from the individual Beatles. Brian overdosed on sleeping pills and died while the Beatles were attending a seminar with the Maharaji Mahesh Yogi. The books say he was despondent over the Beatles’ decision to quit touring, as it left him little to do. Brian’s death rocked the Beatles so severely that the group never fully recovered. Performance for the Queen, John’s “rattle your jewelry” remark. On November 4, 1963, the Beatles played in front of the Queen at the Royal Command Variety Performance. The scene is immortalized in the Anthology video. Before playing their final number, John asked the audience for their help in the next number, and said, with a hesitant smirk: “The people in the cheaper seats, clap your hands… and if the rest of you would just rattle your jewelry.” The camera pans to the Queen, who seems confused more than anything. The Beatles then launched into the raucous “Shout!”. You can hear it on the Anthology CDs. Bob Dylan turns Beatles on to pot for the first time. This event with Bob Dylan is supposed to have occurred sometime during the Beatles’ 1964 tour of America in a hotel room in New York City, although I have read reports of it occuring during Bob Dylan’s 1966 tour in a hotel room in London! I believe this story from The Blacklisted Journalist, who tells of the 1964 meeting, because the Beatles were already smoking pot in large quantities during the filming of Help! (1965). Help! British humor in Beatle films. “I thought she was a sandwich, till she went spare on me hand”: Ringo explains to John. What did he mean? If you want to know what jam butties are, or what “dead grotty” means, check out British humor and Britishisms in Beatles films to find the meaning of some of the jokes in the Help and Hard Day’s Night films. Smoking pot in the Queen’s bathroom. This event, which occurred while the Beatles were receiving their MBEs from the Queen, appears in many Beatles unauthorized biographies. The Beatles were asked the question, did you really nip into the bathroom at Buckingham Palace to share a joint? in the Anthology documentary. George Harrison commented that it wasn’t true, that they were just sharing a normal cigarette because they were trying to get away from the crowds and they were nervous. It was something they always did back then — nip into the bathroom and share ciggies. The “Butcher Cover” and its real meaning. 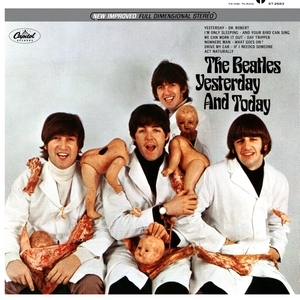 From the interview with Bob Whitaker, photographer: The “butcher” photo was configured as part of a tripartite photo arrangement, suggested by John Lennon and photographed by Bob Whitaker, illustrating several surrealistic images of the Fabs… The Beatles used the “butcher” photo to illustrate an advertising campaign for the single release of “Paperback Writer”/”Rain” in England, though it’s unclear how the photo was meant to sell the fine points of the song. Capitol Records planned to issue an LP called Yesterday…and Today. For its cover, EMI sent (at whose request no one knows) the photo now known as the butcher cover. Those receiving advance copies were surprised and aghast, suggesting that someone at Capitol had lost their sense of propriety, and Capitol recalled the LPs. 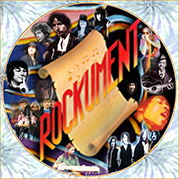 To save the sleeves that had already been printed, Capitol substituted a photo of the Beatles sitting and standing around an open packing trunk, which was pasted over existing butcher covers. John’s “We’re more popular than Jesus” apology. Do you remember when Beatle records were thrown into bonfires across the Bible Belt? John had been quoted out of context in a British magazine interview. His apology was widely televised and has been enshrined in the Anthology documentary. Did “Yesterday” really start as “Scrambled Eggs”? Of course it did. We wouldn’t make up stuff like this, we couldn’t! Paul started the most well-known and covered song in the Beatles canon with these lyrics and changed them later. “Scrambled eggs, Oh you’ve got such lovely legs!” The song startled pop fans at the time because it featured a string quartet with Paul as the only Beatle at the session.